iPhone Call List to Computer Transfer for Mac - Transfer Call List, Music, Video from iPhone to Mac. Prevent all iPhone Call list being lost and damaged, you have to transfer iPhone Call List files to Mac computer for backup. 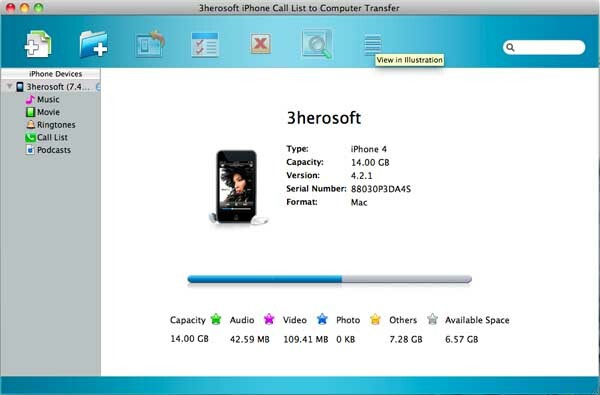 3herosoft iPhone Call List to Computer Transfer for Mac is copy iPhone Call List in TXT format files on your Mac and you can check Call history on Mac computer. Moreover you can import music, video, podcast to iPhone library and sync those files and music playlists to iTunes library, surely copy them to Mac local for backup and it even fully supports the latest updates, and applies to the newly Apple devices, such as iOS 8 and iTunes 12.
iPhone Call List Transfer for Mac even supports all types of iPhone, iPod, iPads including iPad, iPad 2, the new iPad, iPad 4, iPad mini, iPhone 3, iPhone 4, iPhone 5, iPhone 5S/5C, iPhone 6/6 Plus, , etc. Transfer iPhone Call List to Mac local and save those files as TXT on your computer hard disc. iPhone Call List Transfer for Mac can transfer iPhone Music, Video, Podcast, TV Show, Playlists to Mac. Easily transfer Music, Video, Podcast, TV Show from Mac to iPhone without using iTunes, much easier and faster than iTunes! All versions of iPhone such as iPhone 3, iPhone 4, iPhone 5, iPhone 5S/5C, iPhone 6/6 Plus are recognized by this program, you can see all iPhone folders in the list; even the latest iPad 2, new iPad and iPod touch 4 are also supported. Browse all iPhone files with Explorer very easily and fast, read iPhone files like a portable hard drive. Connect iPhone to Mac computer, this program will show all iPhone info such as Type, Version, Format, Capacity, Serial Number, etc. in the interface. How to copy iPhone Call List to Mac computer for backup?